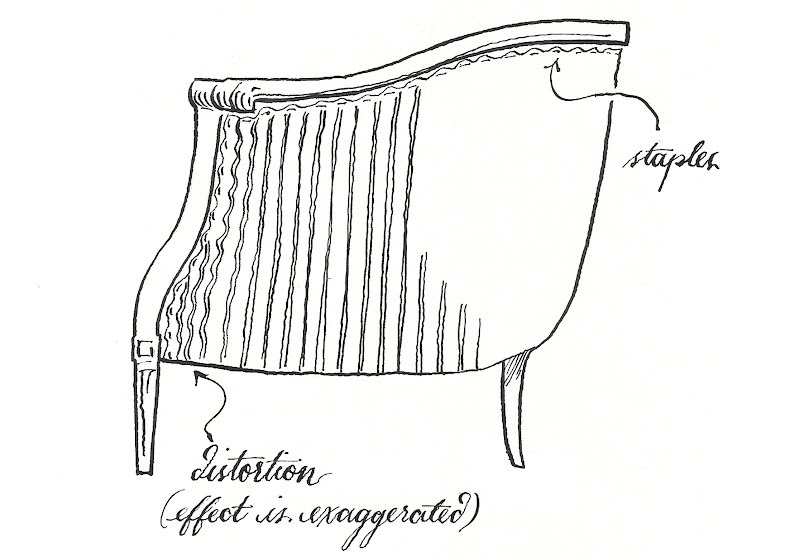 It’s been weeks since the last reupholstery post, so I’ll stop looking at pictures of baby animals online and discuss, instead: Reupholstery: Selecting a Fabric. Picking a fabric is hard for me, partly because the practice of textile sales confuses me. Jessica and I were talking about this the other day, how we don’t completely understand the world of decorator fabric. In magazines, designers mention fabrics by name, or or a caption identifies a fabric, followed by, “To the trade only.” Where are these secret fabric showrooms? Where do you see, let alone get, Scalamandré textiles? And how do designers convince clients to spend a hundred dollars a yard on striped linen? Why? Furthering my confusion is this: Lewis & Sheron and Forsyth Fabrics are two stores that I frequent, on the west side of Atlanta. Lewis & Sheron is a little more high-brow, but the fabrics they sell are basically the same. Once, I found the very same fabric at both L&S and at Forsyth, priced a little differently. At Forsyth, the fabric was called Bonanza; at L&S, it was something different. I asked an employee if it could be the same fabric, from the same supplier, named and priced differently, and she told me that it was very likely – that’s how the industry works. So who are these suppliers? Is it possible to buy fabrics direct? (Probably not, unless you’re in the habit of buying several bolts at a time.) It’s possible that online discount fabric stores, like Fashion Fabric Club, are also selling the “Bonanza” fabric. But it’s impossible to know, unless you bought a sample half-yard and compared it. By the time you order, it might be gone. And where are the name-brand fabrics, the ones mentioned in magazines? I’ll gladly refrain from spending eight times as much money because a fabric was used by Bunny Williams, but I’m still a bit mystified by the practice. The price gap between name-brand and generic textiles is huge. I realize that certain iconic prints only come from one place, but as for solids and stripes, are people convinced that they’re buying better quality? And are they? I bit the bullet, went to Peachtree Fabrics (also on the west side), placed an order, waited for the wrong fabric to arrive, placed another order, changed my mind, canceled the order, and bought 10 yards of Bonanza (with a 10% designer discount) at Forsyth Fabrics. Efficiency is clearly my game. I changed my mind because I worried the linen fabric I ordered first would be too thin. I’ve looked online to find a “correct” weight for upholstery fabric, something like 12 ounces. But Jessica made the point that this measurement can be taken several different ways, and fabrics often aren’t listed this way, anyway. Also, some lighter-weight fabrics, like outdoor nylon, will be more durable than some heavy but loosely-woven cottons. You have to feel the fabric, look at fabric content (a little polyester will strengthen cotton), and go with your gut. This is why I’m leery of buying fabric online. Stripes and patterns, quite simply, can draw attention to the minor shortcomings of the amateur upholsterer, and there will be a few. Stripes and patterns can also contribute to extra fabric waste. Large, bold prints will have to be centered on every cushion, back, and pillow. Not only is this more trouble and care, but it means you can't cut the fabric as closely as your panel shapes will allow; you'll have to leave more room between each shape in order to center the pattern on your panel. You must also consider the way the fabric is printed or woven - railroaded or not. Essentially, on railroaded fabric, the print or stripe is oriented correctly when the fabric is laid horizontally. This way, a single length of fabric can cover an entire sofa back. If it is not railroaded, you would have to cut sections of fabric and piece them together for the length of the back in order to keep your pattern right-side-up. A good description of railroading is found here. A railroaded stripe runs the width of the fabric, not the length. With a solid, the point is moot - it will work either way - with a few exceptions. Velvet, for instance, is tricky because the pile, or lay of the fibers, must all be oriented in the same way. It sounds subtle, but if you cut two pieces from the same velvet, lay them next to each other, and rotate one 180 degrees, they look very different because of the way light hits the pile. For a velvet to be railroaded, when laid horizontally, the pile would look the same from the left side and the right side, but it would look different when viewed from above or below. Be sure that when you trace your panel shapes onto velvet, they are all oriented the same way. Draw arrows indicating the pile direction on the backs of all the pieces before they are cut. You won't have quite as much freedom in the way you lay things out; thus it's slightly less economical. How many yards should you buy? Here is a standard yardage chart. 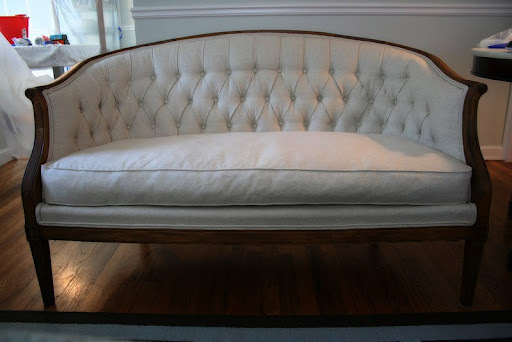 Tufting will add yardage, as will, as mentioned before, large prints or fabric that is not railroaded. The employees that I've talked to at upholstery fabric stores are very knowledgeable and happy to help, so take a picture of your furniture with you. 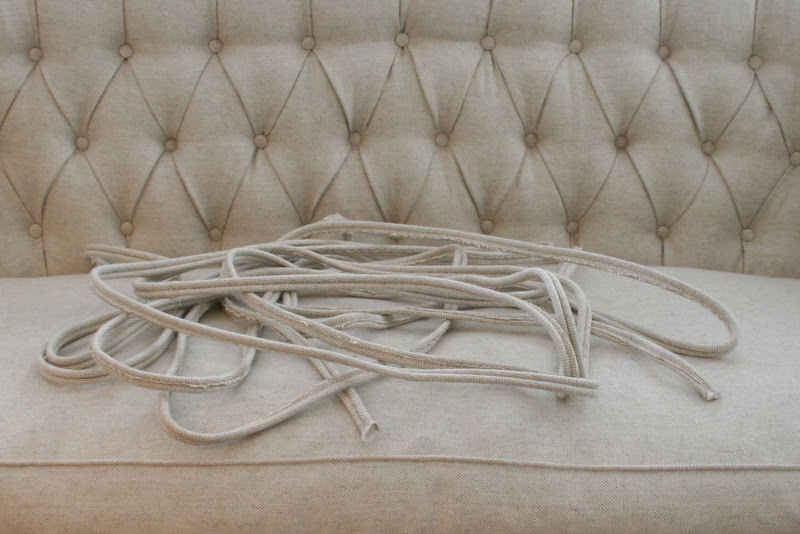 For my settee, which is 50" long and tufted, I purchased 10 yards, to be very safe. I'm left with enough to make two 20" pillows and an extra cover for the bottom cushion. Although Bonanza is heavy-weight, it’s a little loosely woven, and the bias had quite a bit of stretch. So after I’d traced my panel shapes onto the fabric (I’ll talk about this in the next post), I cut out the panels for the cushion and for the back of the sofa, and ironed on fusible interfacing, about $1.99 for a 3-yard package from Joanne’s or Hancock Fabrics. You just need an iron to do this, and it’s easy to do, though it takes a while. This imparted a little more stiffness and stability to the fabric. I left out the back-cushion fabric, because I thought the interfacing might make tufting more difficult. This may have been the wrong decision. As soon as you've got your fabric, call up a few upholstery shops, explain that you're reupholstering your own furniture, and ask if they'll make double-cording and, if necessary, covered buttons for you. Make sure they understand that you're not a professional rival. All five or so of the upholsterers I called were very friendly, if a little skeptical at first, and all said that they'd do it. One guy was really excited that an amateur was trying her hand at reupholstery. Exquisite Upholstery, in Atlanta, did my double-cording for about $2 a yard, and the buttons for 10 cents each, though you shouldn't expect everyone to be this low, especially on the buttons. The shop will want to know what size buttons you need, and whether they have a hook back or another kind. Nesovich's book has dimensions and names for the most common sizes, but if you know the exact diameter of your buttons, that should be enough. I left the upholsterer a few of the old buttons, for certainty's sake. Ask how many yards of fabric they'll need, and cut them. My shop needed two yards of fabric for 10 yards of double-cording and 50 small buttons, but I got about half a yard back. Turnaround was about two days, as I'm sure the $20 job was a low priority. My double-cording was much thicker and wider than that on my other furniture; I hadn't thought to ask about size. I was worried at first, but I love it now that it's on the settee. If this is a concern, you might ask if there are several options for size. Next post, I’ll talk about actually putting the fabric on the settee. Get out your staple gun. I am in the process of re-upholstering a couch and was really worried about how I was going to handle the whole button issue since I didn't want to spend all the money on the button machine...I never even thought about having them done by another upholsterer!! Thank you, you probably saved me hours of frustration! Re fabrics: the system in Australia may be a little different, but here anyone can go to the showrooms and staff are very helpful with information except pricing, for which you have to go to a designer or fabric store. It keeps the retail/wholesale sides of the industry separate. And different stores have different mark-ups, so the same fabric will definitely be cheaper at Bargain Upholstery than through a famous designer. In regard to quality, here the true upholstery fabrics have "rub test" ratings. They literally test how many times a fabric can be rubbed before it starts to disintegrate, and this is more important than thickness or tightness of weave. A thin fabric might perform better than a thick one. I'm no expert and details of the above may be inaccurate, but that's my understanding. So, as you mention, the bottom line is to ask questions of the sales assistant and take advice on the technical detail. I love asking dumb questions in fabric stores: you often learn something unexpected. Linen is generally strong, but a loosely-woven linen might stretch and look saggy in a short time. This is a breathtaking project. I've read parts 5, 1 and 2 and I really admire your resourcefulness, creativity and perseverance. I'm tired just reading about it! But also my fear of furnishing is slowly turning to inspiration, so thank you for that! Thank you so much for all these comments! The "rub test" makes a lot of sense. I'm honestly not sure whether I would have been able to get that kind of technical information at the fabric stores I went to - unfortunately, I feel like the market here is really opaque, whether that's intentional or not. It's been five years since I reupholstered the settee, and the fabric has held up really well, with lots of daily use - so I think I just lucked into a good fabric. I hope you do find inspiration to do a project! I want to see pictures.